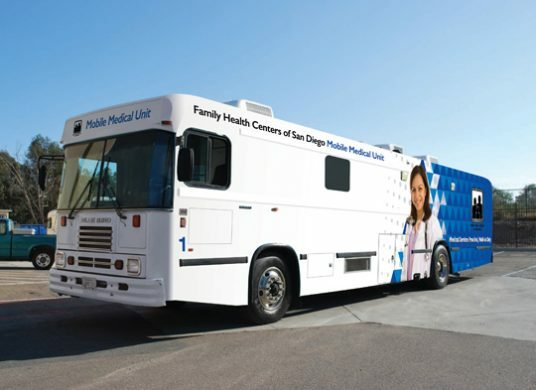 Family Health Centers of San Diego is proud to offer three Mobile Medical Units (MMU), which provide health care services at a variety of locations across San Diego County. Each MMU is a fully licensed primary care health center on wheels and plays a key role in breaking down barriers to health care access for children, adults and families. The MMUs rotate their schedule of locations, which includes schools, social service agencies, parks and shopping centers, each month. To find the location of a MMU, schedule an appointment or to see if an MMU can come to your location, please call (619) 515-2312. Note: Our Mobile Medical Units offer a “flat fee” that covers children services (sick visits, vaccinations and well-child visits), adult services (sick visits and vaccinations) and women’s services (pregnancy testing and family planning). This flat fee applies to walk-in appointments only. If you need after-hours assistance, please contact our on-call physician at (619) 515-2300. If you are experiencing a medical emergency, please call 9-1-1 immediately or go to the emergency room. Conveniently traveling to a location near you, the MCC is a fully licensed mental health center on wheels. For more information, or to schedule an appointment, please call (619) 515-2338.